I approach the subject of the physics of energy and the economy with some trepidation. An economy seems to be a dissipative system, but what does this really mean? There are not many people who understand dissipative systems, and very few who understand how an economy operates. The combination leads to an awfully lot of false beliefs about the energy needs of an economy. The primary issue at hand is that, as a dissipative system, every economy has its own energy needs, just as every forest has its own energy needs (in terms of sunlight) and every plant and animal has its own energy needs, in one form or another. A hurricane is another dissipative system. It needs the energy it gets from warm ocean water. If it moves across land, it will soon weaken and die. There is a fairly narrow range of acceptable energy levels–an animal without enough food weakens and is more likely to be eaten by a predator or to succumb to a disease. A plant without enough sunlight is likely to weaken and die. In fact, the effects of not having enough energy flows may spread more widely than the individual plant or animal that weakens and dies. If the reason a plant dies is because the plant is part of a forest that over time has grown so dense that the plants in the understory cannot get enough light, then there may be a bigger problem. The dying plant material may accumulate to the point of encouraging forest fires. Such a forest fire may burn a fairly wide area of the forest. Thus, the indirect result may be to put to an end a portion of the forest ecosystem itself. These wrong views are amazingly widespread. They seem to underlie the widespread hope that the world can reduce its fossil fuel use by 80% between now and 2050 without badly disturbing the economy. The book 2052: A Forecast for the Next 40 Years by Jorgen Randers seems to reflect these views. Even the “Stabilized World Model” presented in the 1972 book The Limits to Growth by Meadow et al. seems to be based on naive assumptions about how much reduction in energy consumption is possible without causing the economy to collapse. If an economy is a dissipative system, it needs sufficient energy flows. Otherwise, it will collapse in a way that is analogous to animals succumbing to a disease or forests succumbing to forest fires. The primary source of energy flows to the economy seems to come through the leveraging of human labor with supplemental energy products of various types, such as animal labor, fossil fuels, and electricity. For example, a man with a machine (which is made using energy products and operates using energy products) can make more widgets than a man without a machine. A woman operating a computer in a lighted room can make more calculations than a woman who inscribes numbers with a stick on a clay tablet and adds them up in her head, working outside as weather permits. As long as the quantity of supplemental energy supplies keeps rising rapidly enough, human labor can become increasingly productive. This increased productivity can feed through to higher wages. Because of these growing wages, tax payments can be higher. Consumers can also have ever more funds available to buy goods and services from businesses. Thus, an economy can continue to grow. Deeper wells or desalination are needed for water because aquifers deplete and population grows. More productivity is needed from each acre of arable land because of growing population (and thus, falling arable land per person). Larger mines are required as ores of high mineral concentration are exhausted and we are forced to exploit less productive mines. More pollution control devices or higher-cost workarounds (such as “renewables”) are needed as pollution increases. Fossil fuels from cheap-to-extract locations are exhausted, so extraction must come from more difficult-to-extract locations. In theory, even these diminishing returns issues can be overcome, if the leveraging of human labor with supplemental energy is growing quickly enough. Theoretically, technology might also increase economic growth. The catch with technology is that it is very closely related to energy consumption. Without energy consumption, it is not possible to have metals. Most of today’s technology depends (directly or indirectly) on the use of metals. If technology makes a particular type of product cheaper to make, there is also a good chance that more products of that type will be sold. Thus, in the end, growth in technology tends to allow more energy to be consumed. Collapses of economies seem to come from a variety of causes. One of these is inadequate wages of low-ranking workers (those who are not highly educated or of managerial rank). This tends to happen because if there are not enough energy flows to go around, it tends to be the wages of the “bottom-ranking” employees that get squeezed. In some cases, not enough jobs are available; in others, wages are too low. This could be thought of as inadequate return on human labor–a different kind of low Energy Return on Energy Invested (EROEI) than is currently analyzed in most of today’s academic studies. Another area vulnerable to inadequate energy flows is the price level of commodities. If energy flows are inadequate, prices of commodities will tend to fall below the cost of producing these commodities. This can lead to a cutoff of commodity production. If this happens, debt related to commodity production will also tend to default. Defaulting debt can be a huge problem, because of the adverse impact on financial institutions. Another way that inadequate energy flows can manifest themselves is through the falling profitability of companies, such as the falling revenue that banks are now experiencing. Still another way that inadequate energy flows can manifest themselves is through falling tax revenue. Governments of commodity exporters are particularly vulnerable when commodity prices are low. Ultimately, these inadequate energy flows can lead to bankrupt companies and collapsing governments. The closest situation that the US has experienced to collapse is the Depression of the 1930s. The Great Recession of 2007-2009 would represent a slight case of inadequate energy flows–one that could be corrected by a large dose of Quantitative Easing (QE)(leading to the lower cost of borrowing), plus debt stimulus by China. These helped bring oil prices back up again, after they fell in mid-2008. Figure 2. World Oil Supply (production including biofuels, natural gas liquids) and Brent monthly average spot prices, based on EIA data. Clearly, we are now again beginning to experience the effects of inadequate energy flows. This is worrying, because many economies have collapsed in the past when this situation occurred. In an economy, the financial system is the regulator of the energy flows of the system. If the price of a product is low, it dictates that a small share of energy flows will be directed toward that product. If it is high, it indicates that a larger share of energy flows will be directed toward that product. Wages follow a similar pattern, with low wages indicating low flows of energy, and high wages indicating higher flows of energy. Energy flows in fact “pay for” all aspects of the system, including more advanced technology and the changes to the system (more education, less time in the workforce) that make advanced technology possible. One confusing aspect to today’s economy is the use of a “pay you later” approach to paying for energy flows. If the energy flows are inadequate using what we would think of as the natural flows of the system, debt is often used to increase energy flows. Debt has the effect of directing future energy flows in a particular direction, such as paying for a factory, a house, or a car. These flows will be available when the product is already part of the system, and thus are easier to accommodate in the system. The use of increasing debt allows total “demand” for products of many kinds to be higher, because it directs both future flows and current flows of energy toward a product. Since factories, houses and cars are made using commodities, the use of an increasing amount of debt tends to raise commodity prices. With higher commodity prices, more of the resources of the economy are directed toward producing energy products. This allows for increasing energy consumption. This increased energy consumption tends to help flows of energy to many areas of the economy at the same time: wages, taxes, business profitability, and funds for interest and dividend payments. The need for debt greatly increases when an economy begins using fossil fuels, because the use of fossil fuels allows a step-up in lifestyle. There is no way that this step-up in lifestyle can be paid for in advance, because the benefits of the new system are so much better than what was available without fossil fuels. For example, a farmer raising crops using only a hoe for a tool will never be able to save up sufficient funds (energy flows) needed to pay for a tractor. While it may seem bizarre that banks loan money into existence, this approach is in fact essential, if adequate energy flows are to be available to compensate for the better lifestyle that the use of fossil fuels makes possible. Debt needs are low when the cost (really energy cost) of producing energy products is low. Much more debt is needed when the cost of energy extraction is high. The reason more debt is needed is because fossil fuels and other types of energy products tend to leverage human labor, making human labor more productive, as mentioned previously. In order to maintain this leveraging, an adequate quantity of energy products (measured in British Thermal Units or Barrels of Oil Equivalent or some similar unit) is needed. As the required price for energy-products rises, it takes ever-more debt to finance a similar amount of energy product, plus the higher cost of homes, cars, factories, and roads using the higher-cost energy. In fact, with higher energy costs, capital goods of all kinds will tend to be more expensive. 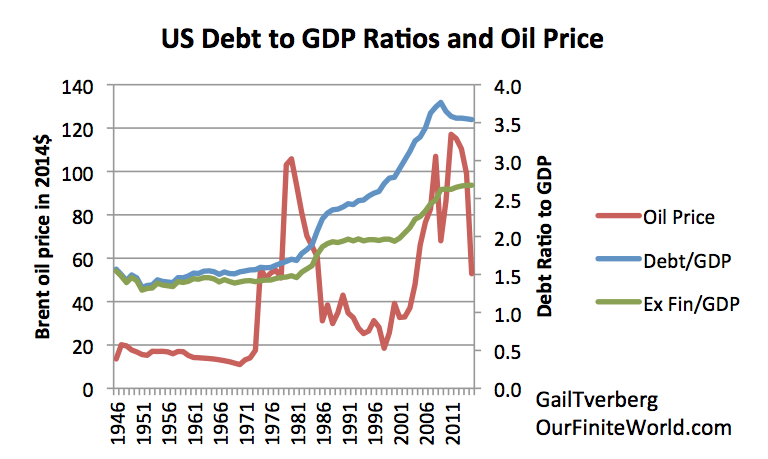 This is a major reason why the ratio of debt to GDP tends to rise as the cost of producing energy products rises. At this point, in the United States it takes approximately $3 of additional debt to increase GDP by $1 (author’s calculation). Figure 3. Inflation adjusted Brent oil prices (in $2014, primarily from BP Statistical Review of World Energy) shown beside two measures of debt for the US economy. One measure of debt is all-inclusive; the other excludes Financial Business debt. Both are based on data from FRED-Federal Reserve of St. Louis. Clearly one of the risk factors to an economy using fossil fuels is that debt levels will become unacceptably high. A second risk is that debt will stop rising fast enough to keep commodity prices at an acceptably high level. The recent slowdown in the growth of debt (Figure 3) no doubt contributes to current low commodity prices. A third risk to the system is that the rate of economic growth will slow over time because even with the large amount of debt added to the system, the leveraging of human labor with supplemental energy will not be sufficient to maintain economic growth in the face of diminishing returns. 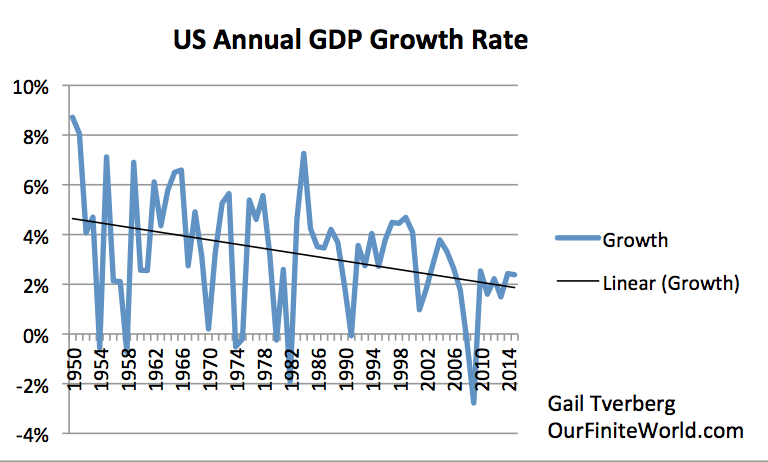 In fact, it is clearly evident that US economic growth has trended downward over time (Figure 4). Figure 4. US annual growth rates (using “real” or inflation adjusted data from the Bureau of Economic Analysis). A fourth risk is that the whole system will become unsustainable. When new debt is issued, there is no real matching with future energy flow. For example, will the wages of those taking on debt to pay for college be sufficiently high that the debtors can afford to have families and buy homes? If not, their lack of adequate income will be one of the factors that make it difficult for the prices of commodities to stay high enough to encourage extraction. One of the issues in today’s economy is that promises of future energy flows extend far beyond what is formally called debt. These promises include shareholder dividends and payments under government programs such as Social Security and Medicare. Reneging on promises such as these is likely to be unpopular with citizens. Stock prices are likely to drop, and private pensions will become unpayable. Governments may be overthrown by disappointed citizens. One recent example of a partial collapse was that of the Former Soviet Union (FSU) in December 1991. I call this a partial collapse, because it “only” involved the collapse of the central government that held together the various republics. The governments of the individual republics remained in place, and many of the services they provided, such as public transportation, continued. The amount of manufacturing performed by the FSU dropped precipitously, as did oil extraction. Prior to the collapse, the FSU had serious financial problems. Shortly before its collapse, the world’s leading industrial nations agreed to lend the Soviet Union $1 billion and defer repayment on $3.6 billion more in debt. A major issue that underlay this collapse was a fall in oil prices to the $30 per barrel range in the 1986 to 2004 period. The Soviet Union was a major oil exporter. The low price had an adverse impact on the economy, a situation similar to that of today. Figure 5. Oil production and price of the Former Soviet Union, based on BP Statistical Review of World Energy 2015. Russia continued to pump oil even after the price dropped in 1986. In fact, it raised oil production, to compensate for the low price (energy flow it received per barrel). This is similar to the situation today, and what we would expect if oil exporters are very dependent on these energy flows, no matter how small. Oil production didn’t fall below the 1986 level until 1989, most likely from inadequate funds for reinvestment. Oil production rose again, once prices rose. Figure 6. Former Soviet Union energy consumption by source, based on BP Statistical Review of World Energy Data 2015. In fact, consumption of all fuels, even nuclear and hydroelectric, fell simultaneously. 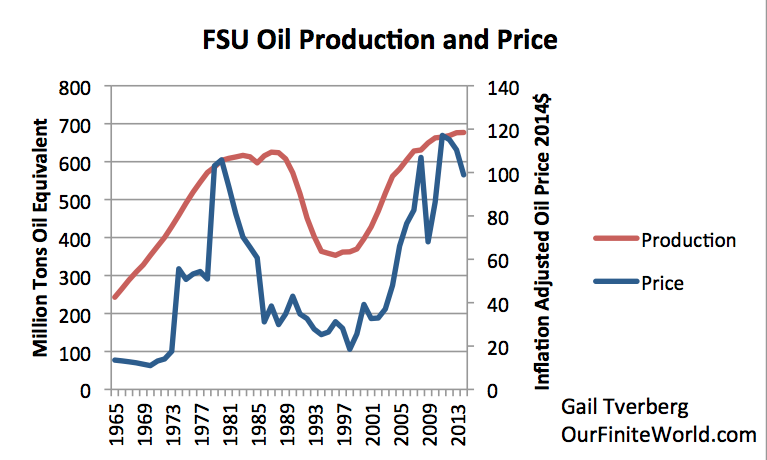 This is what we would expect if the FSU’s problems were caused by the low prices it was receiving as an oil exporter. With low oil prices, there could be few good-paying jobs. Lack of good-paying jobs–in other words, inadequate return on human labor–is what cuts demand for energy products of all kinds. A drop in population took place as well, but it didn’t begin until 1996. The decrease in population continued until 2007. Between 1995 and 2007, population dropped by a total of 1.6%, or a little over 0.1% per year. Before the partial collapse, population was rising about 0.9% per year, so the collapse seems to have reduced the population growth rate by about 1.0% per year. Part of the drop in population was caused by excessive alcohol consumption by some men who had lost their jobs (their sources of energy flows) after the fall of the central government. Beyond the critical point, wealth condenses into two phases that can be compared to a gas phase and a liquid phase. A small number of rich people form the equivalent of a gas phase, whereas a large number of poor people form what corresponds to a liquid phase. Like gas molecules, rich people monopolize most of the energy and have the freedom to move. Embedded in their liquid phase, poor people have lost access to both energy and freedom. Between the two, the so-called middle class collapses. I would wonder whether the ones who die would be equivalent to the solid state. They can no longer move at all. A number of studies have been performed analyzing earlier collapses. Turchin and Nefedov in Secular Cycles analyze eight pre-fossil fuel collapses in detail. Figure 7 shows my interpretation of the pattern they found. Figure 7. 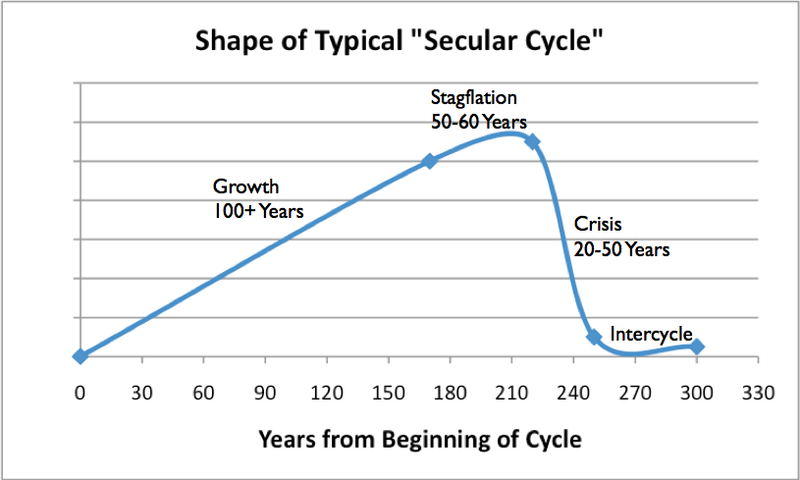 Shape of typical Secular Cycle, based on work of Peter Turchin and Sergey Nefedov in Secular Cycles. Rising population relative to farmland. Either farmland was divided up into smaller plots, so each farmer produced less, or new workers received “service” type jobs, at much reduced wages. The result was falling earnings of many non-elite workers. Spiking food and energy prices. Prices were high at times due to lack of supply, but held down by low wages of workers. Rising need for government to solve problems (for example, fight war to get more land; install irrigation system so get more food from existing land). Led to a need for increased taxes, which impoverished workers could not afford. Increased number of nobles and high-level administrators. Result was increased disparity of wages. Increased debt, as more people could not afford necessities. Eventually, the workers who were weakened by low wages and high taxes tended to succumb to epidemics. Some died in wars. Again, we have a situation of low energy flows, and the lower wage workers not getting enough of these flows. Many died–in some cases as many as 95%. These situations were much more extreme than those of the FSU. On the favorable side, the fact that there were few occupations back in pre-industrial days meant that those who did survive could sometimes resettle with other nearby communities and continue to practice their occupations. Joseph Tainter in The Collapse of Complex Societies talks about the need for increasing complexity, as diminishing returns set in. This would seem to correspond to the need for increased government services and an increased role for businesses. Also included in increased complexity would be increased hierarchical structure. All of these changes would leave a smaller share of the energy flows for the low-ranking workers–a problem mentioned previously. The Second Law of Thermodynamics seems to work in a single direction. It talks about the natural tendency of any “closed” system to degenerate into a more disordered system. With this view, the implication is that the universe will ultimately end in a heat-death, in which everything is at the same temperature. Dissipative systems work in the other direction; they create order where no order previously existed. Economies get ever-more complex, as businesses grow larger and more hierarchical in form, governments provide more services, and the number of different jobs filled by members of the economy proliferate. How do we explain this additional order?
. . . the prevailing view of the second law is an oversimplified version of its true nature. Simply put, entropy is not entirely about disorder. 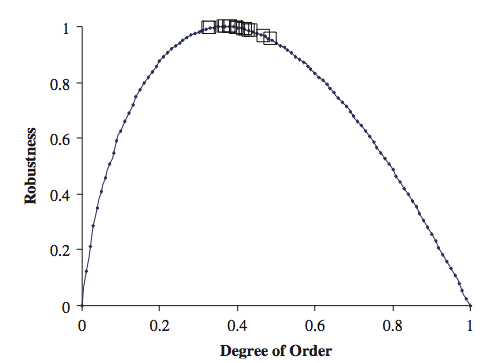 Away from equilibrium, there is an obverse and largely unappreciated side to the second law that, in certain circumstances, mandates the creation of order. We are observing the mandated creation of order. For example, the human body takes chemical energy and transforms it to mechanical energy. There is a dualism to the entropy system that many have not stopped to appreciate. Instead of a trend toward heat death always being the overarching goal, systems have a two-way nature to them. Dissipative systems are able to grow until they reach a point called self-organized criticality or the “critical point”; then they shrink from inadequate energy flows. If we look at world per capita energy consumption, it seems to indicate a very narrow “window of viability” as well. Figure 9. World energy consumption per capita, based on BP Statistical Review of World Energy 2105 data. Year 2015 estimate and notes by G. Tverberg. 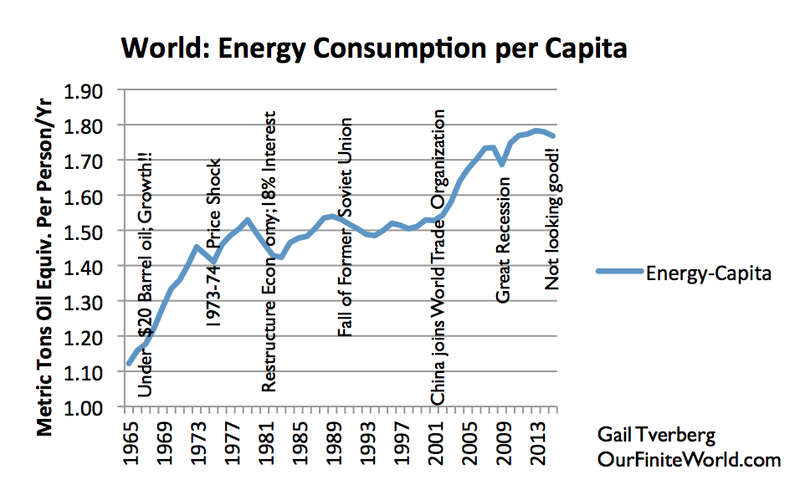 When we look at what happened in the world economy alongside the history of world energy consumption, we can see a pattern. Back prior to 1973, when oil was less than $30 per barrel, oil consumption and the economy grew rapidly. A lot of infrastructure (interstate highways, electric transmission lines, and pipelines) was added in this timeframe. The 1973-1974 price shock and related recession briefly brought energy consumption down. It wasn’t until the restructuring of the economy in the late 1970s and early 1980s that energy consumption really came down. There were many changes made: cars became smaller and more fuel efficient; electricity production was changed from oil to other approaches, often nuclear; regulation of utilities was changed toward greater competition, thus discouraging building infrastructure unless it was absolutely essential. 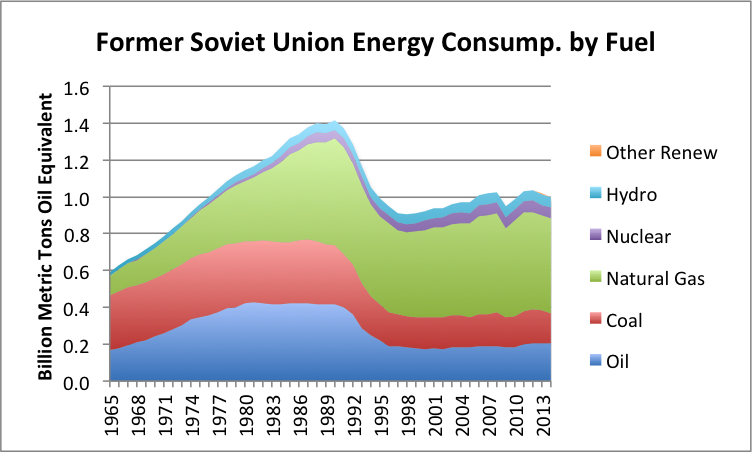 The drop in energy consumption after 1991 reflects the fall of the Former Soviet Union. The huge ramp-up in energy consumption after 2001 represents the effect of adding China (with all of its jobs and coal consumption) to the World Trade Organization. With this change, energy needs became permanently higher, if China was to have enough jobs for its people. Each small dip seems to represent a recession. Recently energy consumption seems to be down again. If we consider low consumption along with low commodity prices, it makes for a worrying situation. Are we approaching a major recession, or worse? If we think of the world economy relative to its critical point, the world economy has been near this point since 1981, but various things have pulled us out. One thing that has helped the economy is the extremely high interest rate (18%) implemented in 1981. This high interest rate pushed down fossil fuel usage at that time. It also gave interest rates a very long way to fall. Falling interest rates have a very favorable impact on the economy. They encourage greater lending and tend to raise the selling prices of stocks. The economy has received a favorable boost from falling interest rates for almost the entire period between 1981 and the present. Other factors were important as well. The fall of the Soviet Union in 1991 bought the rest of the world a little time (and saved oil extraction for later); the addition of China to the World Trade Organization in 2001 added a great deal of cheap coal to the energy mix, helping to bring down energy costs. These low energy costs, plus all of the debt China was able to add, allowed energy consumption and the world economy to grow again–temporarily pulling the world away from the critical point. 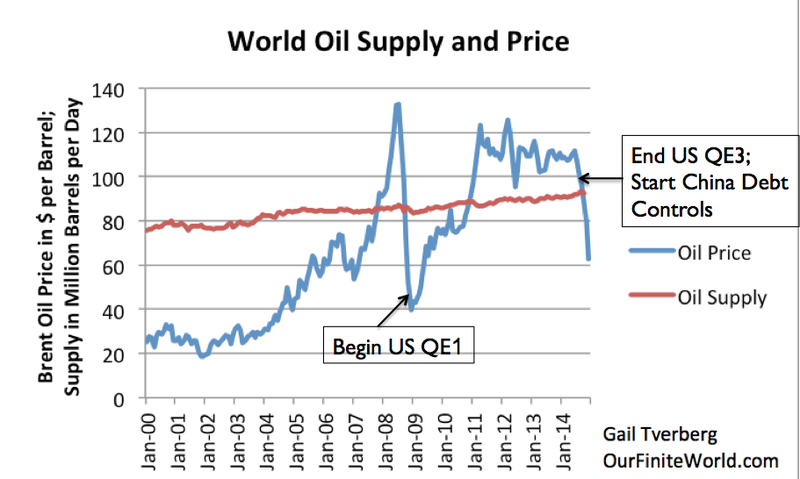 In 2008, oil prices dropped very low. It was only with QE that interest rates could be brought very low, and commodity prices bounced back up to adequate levels. Now we are again faced with low prices. It looks as if we are again at the critical point, and thus the edge of collapse. Once a dissipative structure is past its critical point, Roddier says that what is likely to bring it down is an avalanche of bifurcations. In the case of an economy, these might be debt defaults. In a dissipative structure, both communication and stored information are important. Stored information, which is very close to technology, becomes very important when food is hard to find or energy is high cost to extract. When energy is low-cost to extract, practically anyone can find and make use of energy, so technology is less important. Communication in an economy is done in various ways, including through the use of money and debt. Few people understand the extent to which debt can give false signals about future availability of energy flows. Thus, it is possible for an economy to build up to a very large size, with few realizing that this approach to building an economy is very similar to a Ponzi Scheme. It can continue only as long as energy costs are extremely low, or debt is being rapidly added. In theory, EROEI calculations (comparing energy produced by a device or energy product to fossil fuel energy consumed increasing this product) should communicate the “value” of a particular energy product. Unfortunately, this calculation is based the common misunderstanding of the nature of the physics problem that I mentioned at the beginning of the article. (This is also true for similar analyses, such as Lifecycle Analyses.) These calculations would communicate valuable information, if our problem were “running out” of fossil fuels, and if the way to mitigate this problem were to use fossil fuels as sparingly as possible. If our problem is rising debt levels, EROEI and similar calculations do nothing to show us how to mitigate the problem. If the economy collapses, it will collapse down to a lower sustainable level. Much of the world’s infrastructure was built when oil could be extracted for $20 per barrel. That time is long gone. So, it looks like the world will need to collapse back to a level before fossil fuels–perhaps much before fossil fuels. If it is any consolation, Prof. Roddier says that once new economies begin to form again, the survivors after collapse will tend to be more co-operative. In fact, he offers this graphic. We know that if there are survivors, new economies will be likely. We don’t know precisely what they will be like, except that they will be limited to using resources that are available at that time. THERMODYNAMIQUE DE L’ÉVOLUTION “UN ESSAI DE THERMO-BIO-SOCIOLOGIE” -The Thermodynamics of Evolution – Book, soon to be translated to English. Will at some point be available from the same site in English. In this talk, I show that Per Bak’s neural network model can be used to describe an economic system as a neural network of agents exchanging money. The paper gives a brief explanation on how economies collapse. In this talk, I describe economy in terms of Gibbs-Duhem potentials (akin to chemical potentials). Money flows measure entropy flows (with opposite sign). The cost of energy plays the role of an inverse temperature. I show that economic cycles are similar to those of a steam engine. They self organize around a critical point. 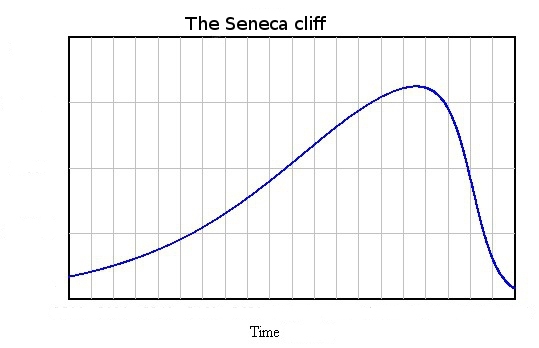 This entry was posted in Financial Implications and tagged commodity prices, debt default, dissipative structure, dissipative system, oil prices, physics, Seneca cliff. Bookmark the permalink. Fast Eddy…this says it all..1.7 Million Syrian Refugees To Lose Their Main Source of Food Aid….budgets too stretched to fund all crises, namely Ebola…. And we think we have worries and concerns! He made some good points, but I lost interest when he suggested that post collapse would begin to rectify itself after 60 – 90 days or so. He doesn’t go into how a recovery will be possible. “We should all prepare”, but avoids go into the details. He expects cities like NY to go up in flames, but says it’s rediculous to store much food or amno. It seems that “V” only has a wallet size copy of the big picture. A glass half full perspective even when the glass gets emptied. There are a lot of questions even with that scenario, like what technology is still viable including motorized transport? How many people emerge on the other side of 60-90 days? 2-3 months is a long time for there to be a collapse. Anybody with sufficient food and water will perish. What is it that gets rectified? Tilling the soil? Let’s take for example a person that has compiled enough food, water etc. to last until an attempt at rectification takes place. Let’s say that person A hasn’t worked a day in their life that included hard manual labor, is 60 pounds overweight, takes five different forms of medication and is over 50. What are the chances that person can adapt to a life of hard labor working the fields for a commune to get 1500 calories a day. After being use to 4000 calories a day and having to work so hard without medication, will that person tap out and be kicked out of the commune or completely rehabilitate their body into a physically fit hard working machine? Doubtful at best. The only people available for rectification will be fit, fairly young or at least young in physical ability, not on a lot of life saving medications and capable of living on mostly locally grown greens rather than pizzas and soda. The weeding out process of people that cannot fit into a post collapse commune will be a process that will probably last 6-12 months. Many will try in vain to make the transition only to quickly or more slowly fall apart, or be rejected as a lost cause. Anyone contemplating making it through the bottleneck will need to keep this in mind. There is another consideration as well. Entertainment and other stimuli that keep the masses rumbling along will be mostly gone. The phones won’t buzz, the TV’s won’t broadcast, the DVD’s will only work if one of the last working generators is working and it will probably get used for night lighting instead of TV. People will go through withdrawals for many reasons including a dramatically reduced level of entertainment. Things will go silent except the task master delegating hard labor. Takeaways… there is not right and wrong … only interests..
Bahrain has exactly the same situation — yet the Elders support the regime…. Egypt has exactly the same situation yet the Elders support the regime etc etc etc… for whatever reasons… some dictators stay… some must go…. Also — should the opposition take over … they’d do exactly the same things that the current regime does… as they did when they were in power prior to papa Assad…. also reposted by RE on the Doomstead diner. I copied the article to the “Land Use” thread of NBL. Just a note from personal experience: in these processes where a public good is privatised, the risk tends to remain with the public sector. That means when things go wrong, people fall ill, or risk to life and limb, the perpetrator will claim inexperience, or that there was no way of foreseeing (eg by asking just about anybody) that things might go wrong. Hence if you have the political capital to wrest public into private, you also have the ability to avoid the consequences. Excepting people dying, that is. Even then, the chances of the right people spending some time in jail are slim.